How To Make Vegan Custard With Only 4 Ingredients! This is a simple, basic vegan custard recipe, and probably the easiest homemade one you will find. I use in many of my sweet treat recipes, and after you master the steps, there won’t be anything stopping you from whipping up a creamy dessert. You can serve it in a tart base, topped with any seasonal fruit of your choice, or in individual serving dishes. It’s easy to make, requires only 4 basic ingredients, and takes less than 10 minutes to prepare. This vegan custard is also very versatile. If you want to turn it into a vanilla flavored custard then simply add a vanilla bean. You can even replace the orange juice with coconut milk, and add a tablespoon of lemon juice instead. 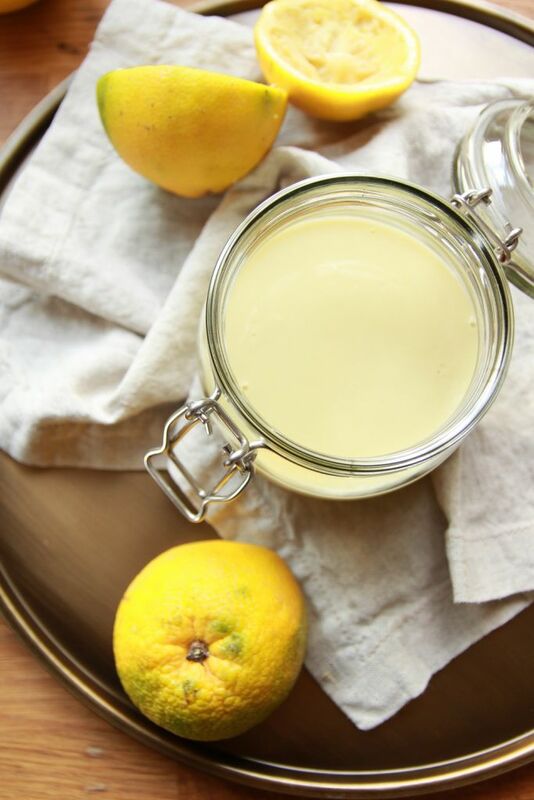 Or you can add a drop or two of almond extract in place of the lemon juice, if you prefer the taste better. It’s up to you! Mix together the coconut milk, orange juice and maple syrup and place in a small pot. Take out 4 tablespoons and place in a bowl. Place the cornstarch in the bowl and mix well until combined. Bring the pot to a boil on medium heat, then when it reaches a boil take it off the heat. Next, while constantly whisking, add the cornstarch mixture. Bring the pot back to the stove and lower the heat. Constantly whisk until your custard starts to bubble. Take it off the heat and continue whisking for an extra minute. This will ensure that your cream stays nice and smooth and no unwanted lumps will form. Pour into serving glasses, a tart base or whatever you wish to serve it in, then transfer to the fridge for a couple of hours to set and enjoy! TIP – I get the best results when I pour the custard directly into a serving dish or onto a tart base when ready, instead of letting it cool down first. Here’s a delicious recipe to try with this vegan custard recipe. 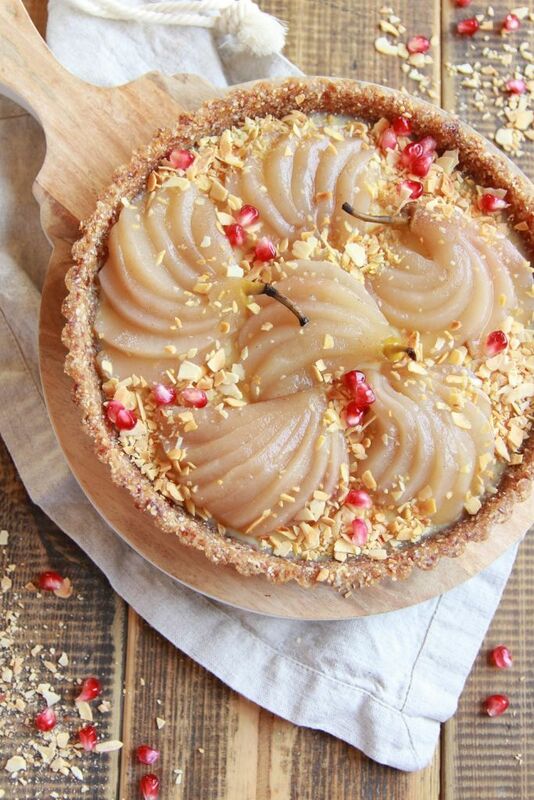 It’s a no bake poached pear custard tart, and it’s refined sugar free, oil free, gluten free, and incredibly delicious! ← Puffed Rice Granola Clusters – Oil Free, Vegan! The coconut milk is th kind in a cardboard box in the “dairy” case or canned coconut milk like from Thai kitchens? What could I use instead of coconut milk? Looks amazing! Does it have a very strong orange taste (ie should I account for an orange taste in my recipe)?